Gabi Shull had always dreamed of becoming a dancer – of soaring through the air, pirouetting in pink satin shoes and performing classic ballets in front of a spellbound audience. Then tragedy struck. In 2011 Gabi, then nine, was ice-skating when she fell and hurt her knee. Two weeks later the bruising and swelling were still there so her mom, Debbie, took her to the doctor, who recommended she have x-rays to get to see what was going on. And there was a lot going on. “I think your daughter has cancer,” the doctor told her mom. He was right: the little girl had osteosarcoma, a form of bone cancer. 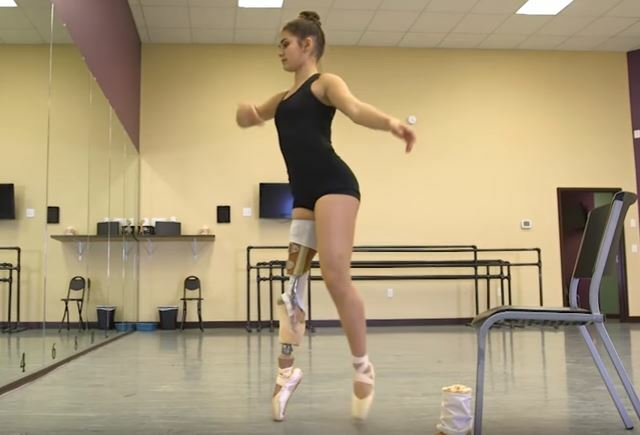 In order to save Gabi’s life doctors amputated her leg at the knee – but aware of her passion for ballet they performed a remarkable procedure, reattaching her foot and ankle joint to her stump which would give her greater control of her prosthesis and enable her to dance. The surgery is known as rotationplasty and allows for mobility and movement. After her knee joint was removed, surgeons rotated her foot a full 180 degrees and rejoined it to her leg, allowing it to function like a knee, according to People. “Before the surgery we talked it through with Gabi and looked at videos of kids roller blading, rock climbing and water skiing after having a rotationplasty,” Debbie says. Her love of dancing hastened her recovery. “After I had my leg amputated the first call was to just get me walking again and out of the hospital bed,” she told DailyMail. Six years later Gabi (15) is an accomplished dancer and regularly takes part in competitions and shows. She hopes her story will inspire other kids who are dealing with cancer and, through her social media campaign The Truth 365, is creating awareness through her story of perseverance and endurance. “When I’m older I’d like to specialise in paediatrics or work as a scientist looking for a cure for cancer,” she says.